Color is a property of light that depends on the frequency of light waves. Frequency is defined as the number of wave segments that pass a given point every second. In most cases, when people talk about light, they are referring to white light. The best example of white light is ordinary sunlight: light that comes from the Sun. Light is a form of electromagnetic radiation: a form of energy carried by waves. The term "electromagnetic radiation" refers to a vast range of energy waves, including gamma rays, X rays, ultraviolet rays, visible light, infrared radiation, microwaves, radar, and radio waves. Of all these forms, only one can be detected by the human eye: visible light. White light (such as sunlight) and colors are closely related. A piece of glass or crystal can cause a beam of sunlight to break up into a rainbow: a beautiful separation of colors. The technical term for a rainbow is a spectrum. The colors in a spectrum range from deep purple to brilliant red. One way to remember the colors of the spectrum is with the mnemonic device (memory clue) ROY G. BIV, which stands for Red, Orange, Yellow, Green, Blue, Indigo, and Violet. English physicist Isaac Newton (1642–1727) was the first person to study the connection between white light and colors. Newton caused a beam of white light to fall on a glass prism and found that the white light was broken up into a spectrum. He then placed a second prism in front of the first and found that the colors could be brought back together into a beam of white light. A rainbow is a naturally occurring illustration of Newton's experiment. Instead of a glass prism, though, it is tiny droplets of rainwater that cause sunlight to break up into a spectrum of colors, a spectrum we call a rainbow. The word "color" actually refers to the light of a particular color, such as red light, yellow light, or blue light. The color of a light beam depends on just one factor: the wavelength of the light. Wavelength is defined as the distance between two exactly identical parts of a given wave. Red light consists of light waves with a wavelength of about 700 nanometers (billionths of a meter), yellow light has wavelengths of about 550 nanometers, and blue light has wavelengths of about 450 nanometers. But the wavelengths of colored light are not limited to specific ranges. For example, waves that have wavelengths of 600, 625, 650, and 675 nanometers would have orange, orangish-red, reddish-orange, and, finally, red colors. Color: A property of light determined by its wavelength. Colorant: A chemical substance—such as ink, paint, crayons, or chalk—that gives color to materials. Complementary colors: Two colors that, when mixed with each other, produce white light. Electromagnetic radiation: A form of energy carried by waves. Frequency: The number of segments in a wave that pass a given point every second. Gray: A color produced by mixing white and black. Hue: The name given to a color on the basis of its frequency. Light: A form of energy that travels in waves. Nanometer: A unit of length; this measurement is equal to one-billionth of a meter. Pigment: A substance that displays a color because of the wavelengths of light that it reflects. Primary colors: Colors that, when mixed with each other, produce white light. Shade: The color produced by mixing a color with black. Spectrum: The band of colors that forms when white light is passed through a prism. Tint: The color formed by mixing a given color with white. Tone: The color formed by mixing a given color with gray (black and white). Wavelength: The distance between two exactly identical parts of a wave. Light can be seen only when it reflects off some object. For example, as you look out across a field, you cannot see beams of light passing through the air, but you can see the green of trees, the brown of fences, and the yellow petals of flowers because of light reflected by these objects. Now imagine that an object absorbs (soaks up) all wavelengths of light that strike it. That is, no parts of the spectrum are reflected. This object is black, a word that is used to describe an object that reflects no radiation. Finally, imagine an object that reflects light with a wavelength of about 500 nanometers. Such an object will absorb all wavelengths of light except those close to 500 nanometers. It will be impossible to see red light (700 nanometers), violet light (400 nanometers), or blue light (450 nanometers) because those parts of the spectrum are all absorbed by the object. The only light that is reflected—and the only color that can be seen—is green, which has a wavelength of about 500 nanometers. 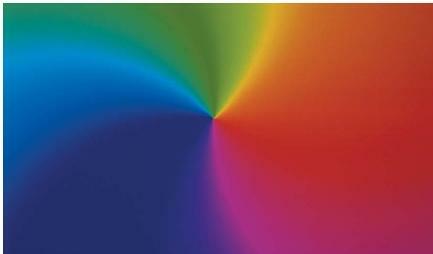 White light can be produced by combining all colors of the spectrum at once, as Newton discovered. However, it is also possible to make white light by combining only three colors in the spectrum: red, green, and blue. For this reason, these three colors of light are known as the primary colors. (For more on the concept of primary colors, see subhead titled "Pigments.") In addition to white light, all colors of the spectrum can be produced by an appropriate mixing of the primary colors. For example, red and green lights will combine to form yellow light. It is also possible to make white light by combining only two colors, although these two colors are not primary colors. For example, the combination of a bluish-violet light and a yellow light form white light. Any two colors that produce white light, such as bluish-violet and yellow, are known as complementary colors. Hue: The basic name of a color, as determined by its frequency. Light with a wavelength of 600 nanometers is said to have an orange hue. Gray: The color produced by mixing white and black. Shade: The color produced by mixing a color with black. For example, the shade known as maroon is formed by mixing red and black. Tint: The color formed by mixing a color with white. Pink is produced when red and white are mixed. Tone: The color formed by mixing a color with gray (black and white). Red plus white plus black results in the tone known as rose. A pigment is a substance that reflects only certain wavelengths of light. Strictly speaking, there is no such thing as a white pigment because such a substance would reflect all wavelengths of light. A red pigment is one that reflects light with a wavelength of about 700 nanometers; a blue pigment is one that reflects light with a wavelength of about 450 nanometers. The rules for combining pigment colors are different from those for combining light colors. For example, combining yellow paint and blue paint produces green paint. Combining red paint with yellow paint produces orange paint. And combining all three of the primary colors of paints—yellow, blue, and red—produces black paint. Color effects occur in many different situations in the natural world. For example, the swirling colors in a soap bubble are produced by interference, a process in which light is reflected from two different surfaces very close to each other. The soap bubble is made of a very thin layer of soap: the inside and outside surfaces are less than a millimeter away from each other. When light strikes the bubble, then, it is reflected from both the outer surface and from the inside surface of the bubble. The two reflected beams of light interfere with each other in such a way that some wavelengths of light are reinforced, while others are canceled out. It is by this mechanism that the colors of the soap bubble are produced. Hi this article is exteremely helpful; however I was wondering if you would know if you were given a blue glass, what wavelengths of visible light should pass through and which ones should be absorbed and why. this article was very helpful and made learning about light much simpler. this site took my knowledge to extent, But, i need to know "how do you know that white light consists of diffrent colours?" thanks for this,it is very helpful to every student.and because of this i can simply understand my report about colors..
What happens if you mix a colored light, like red with a white light? Is the red light absorbed as part of the white light and you only see white, or does the red stand out as red? I'M VERY THANKFUL FOR THIS SCIENCE CLARIFIED BECAUSE IT IS VERY USEFUL TO STUDENT AND TEACHER. AND I HOPE U WILL ACEIPED THIS COMMENT THANK? I like the explanation. It is very clear and I am now convinced. May you continue responding our questions especially to those people who have graduated from other course. I am just using this for the preparation of my board exam on September 25, 2011. May God reward you. QUESTION: Why is this considered a misconception? "Colored light is darker than white light?" how are different colours formed from white light? It is really nice. This gave me a lot of information.Thank you so much.